A deceptively charming plant. European folk use of the leaves and roots of Belladonna plant, Atropa belladonna, as an antiseptic and relaxant. The leaves and roots were an ingredient in the traditional witches brew. Dried leaf contains actives which are both narcotic and antispasmodic. Derivative drugs from Belladonna are used medically to dilate the pupil of the eye for examination purposes. Note: Extremely toxic, do not use internally. Belladonna is also known as Deadly Nightshade. Belladonna plant is indigenous to central and southern Europe and prefers calcareous, well-drained soils in a protected, shaded position. Flowers are grayish yellow with red veins, the fruit are glossy purplish black berries containing kidney shaped seeds. Drought and frost resistant. A perennial plant, growing to 1.5m x 1.5m. 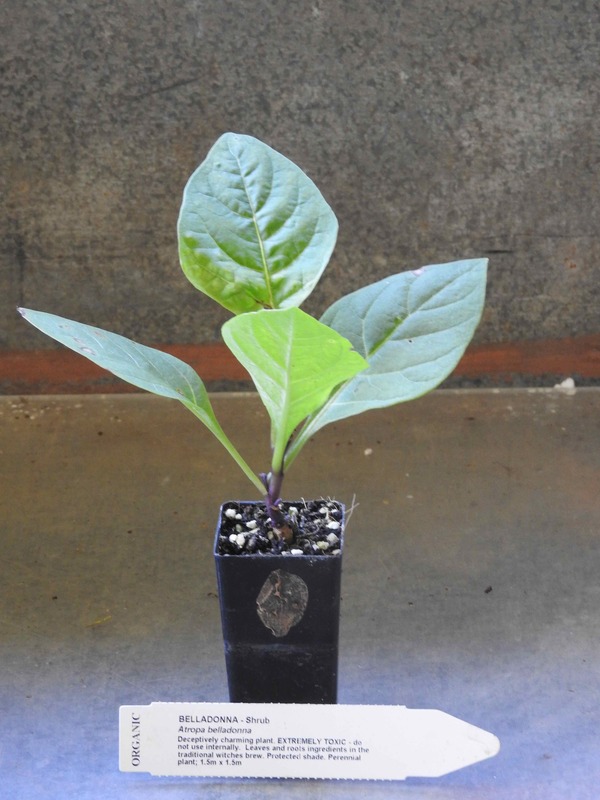 Seed for Belladonna plant are also available. Be the first to review “Belladonna, plant” Click here to cancel reply.